“That is, the teacher says, in the first instance: ‘Here is the music, now play it and at the next lesson I will criticise you.’ Criticism means pointing out to the student this and that thing which does not please the teacher. The poor pupil is therefore blamed for errors which he makes out of his own ignorance. It never seems to occur to the teacher that it is his duty to make the pupil understand how to play before he permits him to play. That is, the pupil should understand certain principles which must be mastered before his brain can work correctly and profitably, without the waste of the time of both the teacher and the student. “The second error comes from encouraging the student to imitate. Imitation may be ‘the sincerest flattery,’ but mere imitation without original creative thinking is liable to be destructive to the pupil’s initiative and to the development of his own artistic sense, without which his playing becomes insufferable. The pupil cannot act without being told how. The actions of the hands and arms of the master pianist are so complicated and at the same time so subtle that only an artist can divine how they are done. The pupil who is encouraged to imitate may struggle through months of disappointment and never achieve anything. More than this, there are very few students with an analytical power of any consequence. “Then it should be remembered that imitation is the lowest phase of education. It is the monkey stage, and requires the least brain action. For this reason one should start from these standpoints. Rather let the teacher provide the pupil with a definite reason for the principal kinds of action at the keyboard. Only in this way can the pupil acquire a technic that will include the mind, the muscles and the nerves. Piano playing is an art and not merely a few cheap tricks learned by empirical practice or by imitation. “When one has mastered the art of piano playing, when one knows the science back of this art, one comes into possession of something of real tangible value, not an inconsequential nothing composed of a few clap-trap devices. “This would embrace, first of all, everything that has to do with correct notation and the interpretation of that notation. This is the ‘know how’ phase. Schumann, great tone poet that he was, did not perfectly comprehend the matter of writing properly and beautifully for the orchestra. His pianoforte works and his songs are masterly, as are his orchestral works, but he did not comprehend the proper way of bringing out the best from the various instruments as did, for instance, Wagner and Berlioz. Here we have a great master deficient in this mental phase of notation. “In a vastly less manner there are thousands of students who struggle with music for years, who do not properly know the subject of notation and the interpretation of that notation. In this phase, I would place everything from the learning of the notes to all of the finer points that are liable to come upon the printed music page. No one can advance very much until these principles have been mastered. What really happens? Thousands of students have some elementary instruction book which is employed to teach them the clefs, the staff, the notes, pitch and a few other things, after which the subject of notation and its interpretation is abandoned. The student should learn to master all of the various notations for all of the rhythmic forms, all the shades of expression, all the phases of touch, so that the printed page will have a real significance to him. He should become able to uphold his personal interpretation by a logical understanding of not only the notation but also the concept which the composer succeeded more or less to express and define by the notation. “Too little attention is given to this mental phase by teachers. Exercises in time, rhythm, dynamics and so on, are neglected, to the loss of the pupil. To revert to the case of Schumann, here we have the case of a tone poet of great genius (sometimes considered organically superior to Beethoven), whose orchestral expression (that is, his understanding of the possibilities of the instruments of the orchestra and how to indicate these means on paper) was so deficient that it often happened that others had to fix up his works. This was also the case of Moussorgsky. Moussorgsky was deficient in the mental phase of his technical development. Rimsky-Korsakoff was obliged to rework many of Moussorgsky’s works. There are numerous pianists who are so deficient in this mental phase that they have never gained the control of their own possibilities. “The mental phase embraces a very great number of things and affords the serious student material for years of study. It includes broad principles and little matters of detail. For instance, in the mental phase would come the principle that when a melody ascends it generally gathers intensity or force. When it descends it diminishes in force, tending toward relaxation. This principle is observed almost universally by sensitive artists. Take the Busoni edition of Bach’s Forty-Eight Preludes and Fugues, for instance, and note how the great interpreter has indicated that the phrases gain in intensity as the pitch ascends. “Another principle is the relative thickness or thinness of the scoring. By this I mean the volume of tone requested by the varying quantity of voices. For instance, a single melody would not command the same volume that the pianist would be expected to give to the same melody played in octaves. If the same melody were to be amplified by chords, the third degree of force would be expected. This general principle is readily understood if the performer will realize that the composer naturally expects more tone volume as he multiplies the number of voices. It is similar to the organist who pulls out a large number of stops. This produces a great volume of tone. If he employs only one or two of the lighter stops the volume of tone is slight. Of course, all general principles of this kind are subject to modification. Sometimes a single melodic phrase expressed with a single line of notes calls for a stentorian tone. In general, however, the score ‘thickens’ as the number of voices increases, and where great chords are employed, the composer has intended that volume of tone shall increase. “The second stage of pianoforte study I would call the physiological phase. This phase is second in order only, but by no means secondary in importance. Like the other phases it should be worked in alternation, each phase reacting upon the other. It is my conviction that unless one understands the nature of the playing apparatus—and by that I mean the general character of the muscular apparatus from the shoulder to the keyboard, and, more than this, the relation of this general apparatus to the body as a whole—one cannot properly and intelligently be expected to play really well. Let us take, for instance, one little principle. There is a great prejudice among certain teachers in the matter of investigating the muscles and the nerve centers employed in playing. This prejudice is due to ignorance. These teachers think that such knowledge makes the player self-conscious. On the contrary, it frees the intelligent pupil from various phases of self-consciousness. Every student in these days must have differentiated in his mind the principal sets of muscles employed in piano playing—(1) the extensors (and triceps); that is, the muscles that extend the fingers or the arms; and the flexors (and triceps); that is, the muscles which bend the fingers or the arms. (2) The abductors and adductors, which enable the fingers to separate or get close together again. (3) The rotation muscles in the forearm, controlling rotation. “This much is very simple. The pupil says, ‘When I make a stroke of any kind I employ the flexor muscles.’ But he does not know that his extensor should be relaxed at that time. That is the beginning of the error, as it is impossible to employ one set without bringing into play the other set. It is perfectly possible for the mind to concentrate upon either the flexors or the extensors. The trouble is that thousands of students do not realize this. The result is that there is a kind of tug of war between the two sets of muscles which has only one name—muscular tension. While this exists, relaxation is impossible. If the contraction of both sets of muscles occurs at the same time, there results a stiffening of the hand, arm and fingers which is an enemy to good tone and technic alike. When there is contraction of the lower set of muscles there should be complete relaxation of the upper set and vice versa. “What however, is the usual prescription given to the pupil? He is told to relax his arm, and he tries his best to make it like a jelly fish by relaxing both complementary muscles. The moment he makes a stroke, or muscular effort of any kind, however, he will contract both complementary (opposite) muscles and all of his old troubles flock back instantly. The pupil should know the name, function and position of all the main muscles and ligaments employed in piano playing. This is all a part of his technic. In time it becomes second nature. It does not obtrude itself on his art in the least. In fact, his art is upon a very unsteady basis without it. The architect who builds beautiful structures must devote years to the study of mechanical drawing and higher mathematics. Does all this necessary study destroy the loveliness of the buildings he produces? Not in the least—if he did not have this knowledge he would be a bungling amateur. “The third phase of the study of the instrument is the instrument itself. Very few people know anything whatever of the nature of the piano. Even the very simplest things are not understood. Take the matter of the piano key, the thing we put into motion when we play. What is it? A lever—with all the characteristics of a lever. If one piano key were exposed to view as a single lever we might learn that a weight placed at the end of the key, which would be sufficient to weigh down the key, need not be so heavy as a weight placed one inch further in on the key. It is simple to try this experiment with a weight sufficient to depress the key when it is placed at the edge nearest the player. Move the weight nearer the music desk and note that it ceases to depress the key. One popular example of a lever is the see-saw. Everyone recollects how the weight of the person sitting on the end of this big lever affects the leverage very much more than when one moves toward the middle, or the fulcrum. “We may learn from this that when we play upon the edge of the keys nearest the player, less power is needed; while, when we play on the keys near the desk or near the black keys more strength is required. Apply this to the pianistic effects and we will realize that when we require force we must play toward the edge of the keys unless we wish to multiply the strain upon the playing muscles. The difference in tone therefore is seriously affected by the point at which you touch the key, providing one employs the same degree of strength at both places. This is only one of many, many things which the student should know about the piano before various phases of touch are considered. The intelligent and experienced teacher provides the pupil with this knowledge and thereby does away with a great deal of the waste of time due to a lack of grasp of fundamental principles. “Finally, the student has to consider the effect of the vibrations he created. He must know the impression that his interpretation makes. He must judge his own playing as though he were hearing it himself, in the audience. By means of this he constantly corrects and improves his work at every step. There must be a continual rotation of sound creations, sound analysis and correction. It may be shown in a circle like this: If one follows the direction of the arrows one may conceive that unless the condition of every section of the circle is thorougly (sic) ‘live’ and responsive, the initial concept (mental vision of the music) will encounter points of interference (such as stiff wrists) where a detrimental loss of quality will occur. “I. The mind receives the impression from the printed page. “II. The mind telegraphs the message to the arm, hands and fingers, setting in operation the muscles. “III. The key moves a hammer which strikes a string and sets the wires in vibration. “IV. The sound travels back to the mind through the ear and is there analyzed for its effect. 1. What are two common shortcomings in teaching? 2. What are the weaknesses in Schumann’s style of composition? 3. How shall the printed page be made of real significance to the student? 4. How does the thickness or thinness of scoring effect touch? 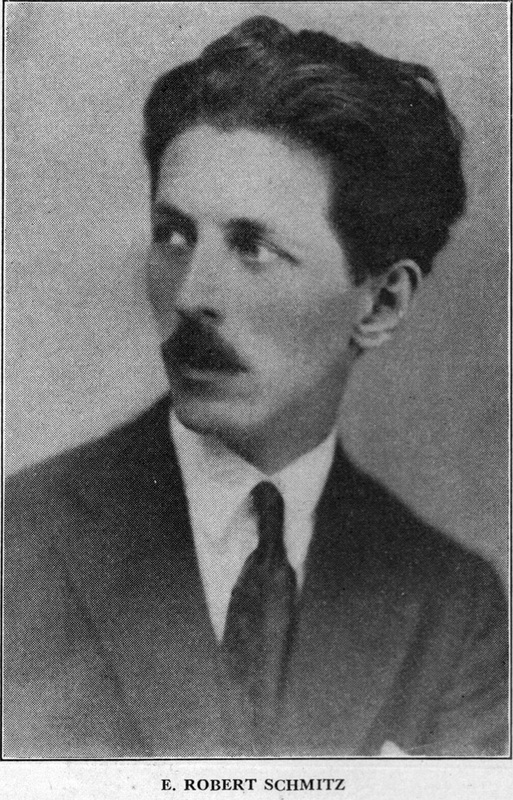 You are reading Modern Ideas in Pianoforte Technic - E. Robert Schmitz from the August, 1925 issue of The Etude Magazine. Virtuosity Versus Musicianship - Cyril Scott is the next entry in The Etude.